AAU Ekpoma Cut off Marks 2019/2020 and Departmental Cut off Point. There are certain criteria to be observed by students before being admitted to study in any of the courses in any university. One of these which include meeting the required cut of mark for each schools as well as the courses itself. It is very easy to obtain admission if one has met the required cut off mark for the admission into a particular course. Following the scrapping out of post UTME by the federal government, the Joints Admission and Matriculation board (JAMB) had given a bench mark of 180 and above for candidates applying for Universities, Polytechnics, Colleges of Education. Hitherto, the Ambrose Alli University, Ekpoma has follow suit in the 180 general cut of mark of JAMB. Candidates with higher scores are first considered; in admission basics, candidates with lower scores though might meet the cut off mark of 180 may likely not be admitted. In fact, it is the higher your scores, the higher the chance of being admitted. The Ambrose Alli University, Ekpoma does not really have a specific cut off mark for courses. However, candidates who have scored a minimum of one 180 in UTME examination is eligible to apply for admission into any of their choice courses. Due to the high number of students wishing to study in the Ambrose Alli University, Ekpoma, the admission processes is competitive and an admission is given based on JAMB score and O level grades. 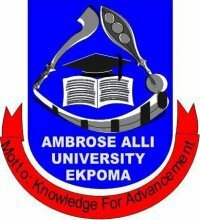 The Ambrose Alli University, Ekpoma holds her admission screening exercises within a week or couple of weeks and it usually comes in two phases. Students who applied to study in the school are to proceed for the pre-screening exercise when once it is being announced. We cherish your opinion and we look forward to it. Hence, if you need us to feed you with more updated information at the right time about AAU Ekpoma Admission 2019, kindly provide us your phone number and email Address in the comment box below.